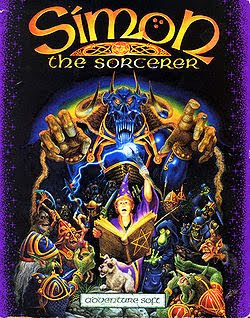 Simon the Sorcerer was the first game in the Simon the Sorcerer series. When Simon chases his dog into a spellbook, he ends up in a magical world. Now he has to journey through this magical world, rescue a wizard, and defeat an evil sorcerer. Simon the Sorcerer is now supported by ScummVM, a program designed to let 2D adventure games run on multiple platforms. With ScummVM, Simon the Sorcerer now runs on modern versions of windows, as well as Linux, Mac OS X, and many consoles such as Dreamcast, Wii, PlayStation 2, and PlayStation Portable. For a complete list of platforms supported by ScummVM, see here. On August 6, 2009, iPhSoft released Simon the Sorcerer for the iPhone and iPod touch using ScummVM and James Woodcock's enhanced soundtrack. On March 2, 2010, the program was updated with support for the iPad. On April 3, 2018, the digital version of Simon the Sorcerer was replaced with a 25th Anniversary Edition by MojoTouch. It has a custom menu to use alternate sound sources such as MT32 music, or James Woodcock's excellent remake of the music in the game. It also gives an option to have original or high definition graphics, but the latter simply uses one of ScummVM's graphics filters. Despite using ScummVM, the shortcut key to get back to the ScummVM menu doesn't work. However, ScummVM will detect the game, so it's possible to play the game without using MojoTouch's menu.